Tõnu Toompark is an Estonian real estate market analyst and a well-known influencer of the field. 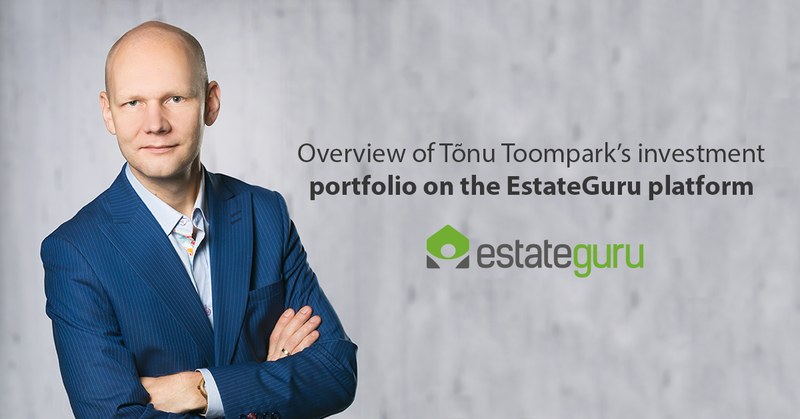 Followingly, Tõnu will give an overview of his portfolio on the EstateGuru platform, of its expectations and future. I have been investing on the EstateGuru platform since the beginning of 2015. Though I started investing with a couple thousand euros, I have gradually grown my portfolio. As of now, I have transferred 93,450€ to my EstateGuru virtual account, most of which during the past year. Currently my investments on the EstateGuru platform are in the proportion to my overall portfolio in which I do not plan to increase them in a similar pace, however I am willing to make exceptional deposits in order to participate in particularly interesting projects from time to time. Therefore, I am mostly planning to reinvest my funds and interest from the current investment opportunities. How many loans am I involved with? At the moment, my portfolio reveals that I am or have been involved with 112 loans on the platform over the years. How many loans have been successfully repaid? There are 32 loans in my portfolio that have been successfully repaid and their interest rate has been in the range between 9.0% – 13.4%. That being said, the actual interest has always been higher than the expected one, this mostly arises from loans being repaid earlier. From the principal amount of 29,375€ I have so far earned 2224€ of interest revenue. How are the outstanding loans performing? At the moment, there are 74 loans in the amount 95,677€ in my portfolio that are still in the “funded” status, thereby the average amount invested into one loan is 1293€. To make invstments, I have decided to make use of the Auto Invest feature that makes automatic investments in the amount of 1000€ into loans that fit my previously set criteria. Should the investment opportunity be particularly interesting and appealing, then I am investing additional funds manually. It is interesting to mention, that there are only 13 loans in my portfolio into which I have made an investment larger than 2000€ which fits my diversification strategy quite well. My current interest revenue from the outstanding loans is 1846€ so far and 3551€ of the principal loan amount has been repaid. Earliest loans in my outstanding portfolio are from 2015, one of which has a period of 5 years – Niguliste 8 loan. As of now, I prefer loans with a maturity period up to 18 months, on certain cases 24 months. Two other outstanding loans from 2015 are Toome avenue and Katusepapi development loan, for which EstateGuru has used their right to prolongue the loan period while increasing the interest or the collateral value. Also, Katusepapi development loan was partially repaid during the prolonging process, which is an indication of the borrower’s capability to manage the loan. For Toome avenue loan, additional collaterals were added during the process – therefore I am not particularly worried for these two loans. Once again, I am hopeful that the interest revenue will be higher than the initial 12.0% and 11.5%. Where do I stand on the late loan payments? Without wishing harm for any of the borrowers, it would be interesting to follow the process of EstateGuru managing default loans and their capabilty to regain the lost funds. Will my expectation and hope that it is possible to regain all interest and principal from default loans secured with mortgages stand? Also, currently there are delays in Tolli 7 brige loan, Taludevahe street bridge loans and Miiduranna villa development loan (update: debt was paid in full on 19.07.2017) interest payments. The portal updates reveal, that respective communication with the borrowers is ongoing and EstateGuru is taking action to solve this circumstance. My expectation as an investor is however, that indemnity payments would follow overdue payments – and the portal has applied indemnity to all overdue interest payments. What is the historic average interest of my portfolio? As a result to increasing my portfolio recently, my cumulative interest revenue so far has been 4150€. Taking this into consideration, the interest from repaid loans is 11.3% which meets my expectations. Of course I would prefer higher returns, however I understand that higher return for loans that are of lower risk and secured with a mortgage is simply not realistic. Overall, I am very happy with my investments on the platform and EstateGuru in general. All my investments have more or less come back in a good manner, which is why it is my intention to keep investing on the platform. It is not reasonable to expect that there will be no issues with any investments when it comes to peer-to-peer lending and investing in general. I am not following the late loans in detail, as I have faith in EstateGuru team’s capabilities to regain my investments. When the loan is repaid later than expected and by doing that earns me additional interest revenue, then I am content with such situations. Tõnu Toompark’s 10 investment tips!